Yesterday, my Mak Enda had a barbeque to welcome her daughter, S, back home. I find that Malaysians tend to be nomads… we wander the earth, but somehow always come back home. I dont know if its the heat or the chili that draws us, but we always find our way back somehow. May be because I was pining for my family in the US, but I decided to make this potato salad. Its very American – and in fact the double dipping of the potatoes was taught to me by my brother in law, R, an American. It makes for a bright, tangy, sweet, creamy and yet not too heavy potato salad. If you can find Vegannaise or another vegan mayonnaise, this can be a vegan recipe. I love the sour tastes of pickle, onion, and peppadew as well as the green fresh herbs in this creamy mix. The balance of flavours and textures is lovely, and ensures that this potato salad is not overwhelmingly rich and creamy. Dont get me wrong, I enjoy rich and creamy, but the contrasts in this salad are beautiful! In typical Malaysian style, the potato salad was served with the grilled meats, sausages, vegetables and mee goreng (fried noodles). Someone clever realised that eating the mee goreng and potato salad together, with some cut chili in soy, was the perfect balance! I know, sounds crazy, but it was actually quite a delicious mixture (if slightly odd), and the perfect example of us mixed up nomads with taste buds from everywhere! This will serve about 10 – 12 people with leftovers (which are fabulous the next day with a fried egg for breakfast!). Make sure you use waxy potatoes – gold, red-skinned, new, fingerling, and charlotte – because these will keep their shape best after having been boiled. 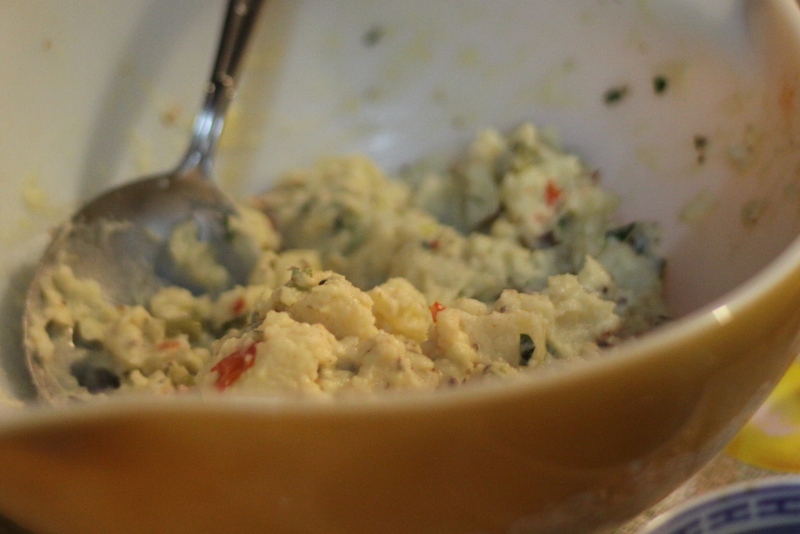 If you use baking or mashing potatoes which are more floury, the potato salad will just fall apart when you try and mix in all the ingredients. I like a cold potato salad but this is just as good if served warm. Peel and roughly chop the potatoes, and place in a large pot. Cover with water, and bring to the boil over high heat. Keep the water simmering, and boil the potatoes for about 20 – 30 minutes, or until a knife can cut through the potato easily. Test every 10 minutes or so, as different varieties of potato cook at different speeds. You want the potatoes to be just cooked through because they will continue to cook once drained. While the potatoes are boiling, whisk together the olive oil, red wine vinegar, lemon juice, oregano, and 1 tsp each of salt and pepper. As soon as the potatoes have cooked, drain them and put them in a large bowl. Pour over the vinaigrette, and using a large spatula, gently mix to ensure all the potatoes are coated. Leave to cool down a bit, about 20 minutes or so. Whisk together 1 tsp each salt and pepper, mayonnaise, mustard, pickle water and minced garlic cloves. Once the potato salad is warm (not piping hot), fold in the mayonnaise mixture and gently mix to ensure all the potatoes are coated well. Chop the pickles, cocktail onions, and peppadews, and fold into the salad along with the parsley and spring onions. Taste, and adjust seasonings. I often add a bit more salt, and sometimes a few more pickles if I want it especially tangy. Cover and refrigerate for at least 2 hours, or serve at room temperature. Eggs are humble things, but they taste spectacular, and they add their special golden glow and richness to lots of different dishes. They therefore should be treated with great honour and respect. I love making things with eggs – custards, quiches, cakes, ice creams. But sometimes, what I really want is the perfect egg in all its glorious eggy-ness. 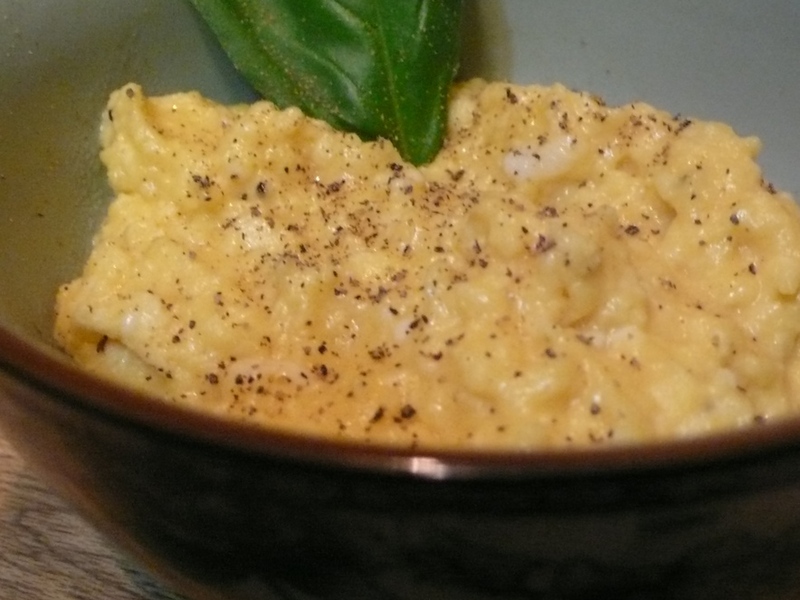 When that happens, I turn to this recipe for creamy eggs. Well, in all honesty, these eggs are scrambled, but the methodology and the finished product are just so different from the regular garden variety scrambled eggs that we started to call them differently. They deserve it. These eggs are creamy to the point of custard, but still most definitely not. They are scrambled, and yet silky, unctuous, rich and light in a way that eggs whipped in a pan could never be. The secret is in the preparation, and because of that, these creamy eggs are really a gift of love. They take a while to make – may be 15 minutes – may be half an hour. It all depends on your heat source, on how well you cushion your eggs from the heat, and how many people (and thus how many eggs) you are feeding. As a result, I would not make this for more than 4 people – but I prefer making it for just 2. Or even, as a gift to myself, for just one. For breakfast or a light supper, these eggs are perfect. Remember though, as a cook, this is a meditative dish. The constant stirring, the thoughtfulness about thickness and balance, the tasting… you have to be in the present when you make these eggs, and what you put into them is what you get out of them. Make sure that you are happy and loving when you make this dish, because if you arent, you will surely taste it in the eggs. You can serve these eggs with lots of things. For non-vegetarians, snippets of silky smoked salmon layered atop the eggs seems like silk on velvet. For the rest of us – the sharpness of basil or another herb, snipped fine, might be a perfect contrast to the sublime richness of the eggs. To be honest though, I serve them with nothing but a crack of black pepper and a silver spoon, nestled in a pretty bowl like golden curds. Sometimes toast might get a look in – just for that crunchy contrast, but honestly, you need nothing but these eggs to bring sunshine and smiles to those you love… incluing yourself! A bain marie or double boiler can easily be made by putting a metal bowl over a saucepan of boiling water. Just make sure the bowl doesnt touch the water, and have a kettle of boiled water standing by in case you need to replenish the water at a critical moment. Start off by filling the saucepan about 1/4 full with water, and setting over low heat to come to the boil. Meanwhile, break the two eggs into a bowl, and very gently, mix in the sour cream or creme fraiche with a fork. Try not to beat the eggs or whip them or form too many bubbles in the mixture. Water and air are the enemy of creamy eggs – they form steam which help puff up the eggs as they cook. You want something much deeper and darker and sensual. Fluffy eggs have their place – but not here! Crack some black pepper and a pinch of salt over. You can adjust later. You just want a tad right now. Once the water is boiling, put the metal bowl on top of the saucepan, and slide your eggs in. No butter, no oil. Just eggs and a little sour cream. With a spatula, start stirring the eggs…. Find a pace and rhythm that works for you. Figure eights usually do it for me. Watch the eggs carefully, and just keep stirring and stirring. Slow and even, no sudden movements, just a gentle silky pattern. You will see the cream slowly dissolve into the eggs, and the mixture go from slightly glossy and transparent to thick and yellow and opaque. Keep stirring. (Thats the basic recipe. Eggs and stir!) Your eggs will go through quite a few stages. They will start gaining thickness, and will look like golden oatmeal porridge. Basically, what you are doing is cooking the water out of the eggs, and encouraging the proteins to thicken and cream. This takes time and gentleness – in heat and in touch. Go fast, and your eggs will respond and go rubbery. When they look like thick oatmeal porridge, you can add a little bit of cold butter for silkiness and smoothness and creamy taste. But you dont have to if you dont want to. What you should do at this point is taste for salt and pepper and adjust accordingly. Keep stirring. 🙂 When the eggs look like a firm cottage cheese or ricotta, take them off the heat immediately. Serve atop crisp toast, or in a bowl with a silver spoon.